$SPY poised for NEW ALL TIME HIGHS! After being in a choppy zone since November of 2014, it is finally looking like the SP500 is re-testing the top end of this range and could very well breakout to new All Time Highs. $SPX 1972 has been the LINE in the Sand and has been defended very easily, with the help of Stimulus around the world that is. Regardless, of what is going on around the world, $SPX $2064 was the double top that was just broken through. If we hold over that level there are very good odds we see $2090-93, and potentially a move straight over $2100. Watch for break-out failure, but as long as $SPX holds $2064 it seems like a better long than short. Good luck out there! I am not long $spy at this time, but I am long $xiv. The ETF for Coffee is $JO. It has had a massive move the last several months and is not looking like it could potentially break down farther. The reason I believe Coffee prices will go back down is because of the same reasons it went up. There has been SEVERE droughts in Brazil and therefore this helped spike the prices of coffee. We are now entering a time when this is changing and BRAZIL is expecting a tremendous amount of rain and this could definitely help their coffee production and in trun bring this $JO back to the $30 or lower. If you $JO breaks the line on the chart to the downside I see this happening. Short $JO or Be long $Jo Puts whatever risk appetite you enjoy. Good luck out there! $spy Do the first 5 days really matter? The SP500 just rallied nearly 30% in 2013 without a correction of any sort. The media is going nuts about how the first 5 days are important and usually set the tone for the year. This seems like 2014 is set up for a big fail then. I would think again. We are having just a bit of pressure, selling, and consolidation in the markets without any real downside, which is great. If we can hold 1828 and then get back above 1845, it looks like we could have another leg higher in this market. My swing targets would be 1865 to 1875 on the next leg up. If we break 1828 i think we test 1815 range. So keep watching and don't miss out on the next leg up because the first 5 days were flat/down. No one is worried about a imminent $Vix spike and Market collapse. End of the year is looking like a gravy train long $SPY and short $VXX. On this recent pullback and pop in $vix it made a lot of sense to get long the market and short volatility till year end. Good luck trading! $aapl has been breaking out and holding. Which is a new theme. Over $531 it looks good. Pre-market today it is at 536 and once it breaks over $539, it could get going to the 1st upside target of $556. The 2nd Target is $595. My stop would be tight at $531. If Apple is going to get going it has to break over $539. Black Friday is coming up and Apple for the 1st time is offering items on SALE in there stores. Not sure exactly how the stock is going to take it, but I do know that they will sell a ton of stuff and drive a lot of traffic to their store. 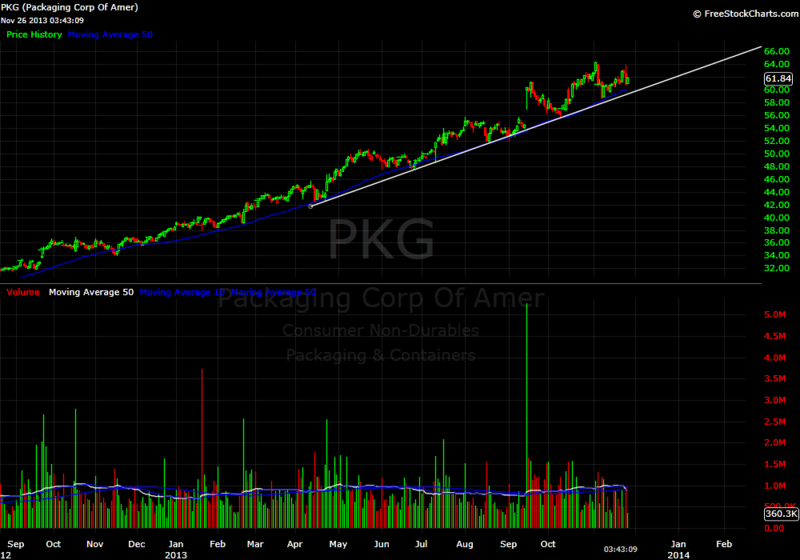 Packaging Corp. (PKG) has been in a steady uptrend for over a year now. It has only broke the 50 day moving average twice, and both were for only one day. It is near the 50 day as we speak as it remains in the trend it has formed. I see this as a good risk/reward opportunity to purchase or add to the stock with a stop under the 50 day. The one red flag I can notice is that is getting a little sloppier than it was earlier this year (wider and looser price action now versus narrow and tight earlier). Earnings remain strong with a nice dividend to boot! 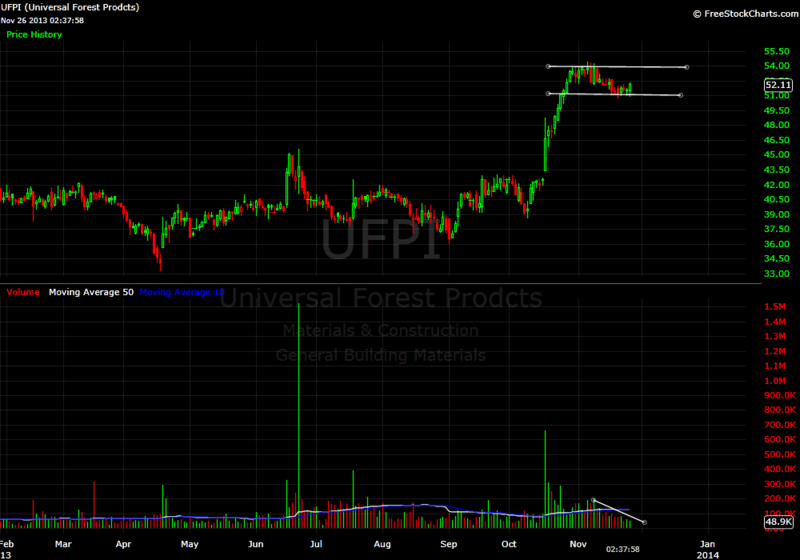 Universal Forest Products (UFPI) broke out in mid October when they had a great earnings report and raised their dividend. The company is smaller with just over $1B market cap, but that is why I love it. You can see in the chart below that since breaking out and running up the weeks after it is has resting in style. The volume has been diminishing as the stock as been holding near highs. It looks like it is putting in a nice bottom and wants to go higher. Fundamentally it is hard to beat. Sure it is currently trading at 31x earnings, but the EPS growth is fantastic at 93% for this current year, and 59% growth projected for next year. My stop would be under 51 and look for a break to new highs on volume. I am long. The $vxx is an ETF that tries to mimic the Volatility index VIX. 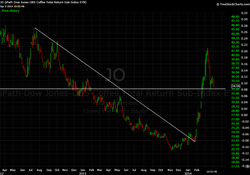 It tries to to this buy purchasing front month $vix calls and keeping a 30 day maturity. Historically $vxx makes a new 52 week low in December due to lack of volatility, less trading days, and the markets usually melt higher during the holidays at the end of the year. Shorting $vxx or going long $xiv is a good trade here with a stop 5 percent from your entry in case the market does turn. For the bold, shorting $tvix and $uvxy can be a nice trade as well for a day, week, or for the month of December. For questions and more updates on the $vxx trades follow @jloesser and @whaletrader on twitter.